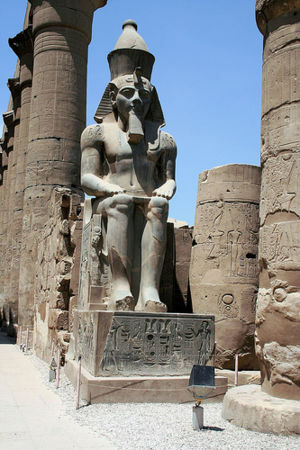 Ramesses II is referred to as the greatest pharaoh that ever lived. He reign over Egypt for 67 years during the 19th dynasty of the 12th century BC. Ramesses II was the 3rd king during the 19th dynasty. He was known as a great peacemaker among his people. Ramesses the II was given the crown and responsibility to rule a country at a very young age. He was given a title when his father, Seti I, was still in power. Seti I gave Ramesses II, the title as regent. Ramesses II when given this name was given his own household and harem. Ramesses II traveled alongside his father seeing and learning the ways of a king. This was all in order to train Ramesses how to govern an army and prepare him for war. At the age of 10, Ramesses II was made a captain of the entire Egyptian army. It was indeed an honor to receive such a powerful position at such a young age. He also received army training while in power. When it was the seventh year of his father's reign (Seti I)Ramesses II was crowned the co-ruler of Egypt. Seti I and Queen Tuya were his birth parents. Ramesses II had 200 wives and concubines, he had 60 daughters and 96 sons. Ramesses II had 8 "main" wives. He had up to what is believed 200 wives, but there were only 8 that actually ruled by his side. His first wife was named Nefetari. She was his favorite and in her honor, Ramesses made her the best tomb out of all of the Valley of King's tombs. Ramesses II was heartbroken when Nefetari died. Nefetari was his most cherished wife. There are and were many paintings of her all throughout his home. Ramesses II had many statues and temples built just for her. Ramesses second wife was Istnofret. Istnofret gave birth to Ramesses' II two most valuable sons. Merenptah, who ended up being Ramesses II successor, and Khaemwese, who ended up being the High Priest of the Temple of Ptah at Memphis. Istnofret lived as the chief queen and then later died. Her tomb is still yet to be discovered, but it is possibly somewhere along the West Bank at Luxor. His third wife was Bent'anta. Bent'anta was buried in the 71st tomb in the Valley of the Queens. 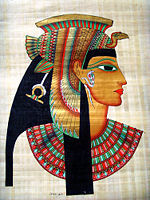 Queen Bent'anta was actually one of Ramesses II daughters with Istnofret. It is believed that she was crowned short after her own mother's death. His fourth wife was named Merit-Amun. Merit-Amun was the oldest daughter of Queen Nefertari. It is presumed that she married Ramesses II after the death of her mother. His fifth wife was named Nebttaui. She was laid to rest in the 60th tomb, also in the Valley of the Queens. Information pertaining to if there was a blood relationship between Ramesses II and Nebattaui is unknown. Ramesses II sixth wife was Hentmire. It is a possibility that Hentmire was the daughter of either Seti I or Ramesses II. If she was a daughter of Seti I then Hentmire was Ramesses II sister. His seventh wife was named Maathomeferure. Maathomeferure was the daughter of Hattusilis III, a Hittite King. Ramesses II married her due to a peace treaty that was signed during Ramesses II 21st year of rulership. In 1239 BC, Maathomeferure died and and Ramesses II was forced to marry another princess from Hittite whose identity is unknown. To the Egyptians, under the rule of Ramesses II, Egypt's western Libyans, Egypt's eastern Asiatics, and Egypt's southern Nubians were all considered enemies. Even when these cities were living in peace and doing nothing to upset Ramesses II's people. In 1274 BC, during the spring Ramesses II marched his army east. There were more than 20,000 men marching with him. Ramesses II split up his army into four different sections. These parties were titled: Re, Ptah, Amun and Seth. Amun was lead by Ramesses II himself. The other leaders are unknown. On their trip they traveled for a period time which lasted months. Their first stop was in Canaan. They then preceded to go until reaching Shabtuna. Shabtuna was about 10 miles from the war zone, Kadesh. Once reaching Kadesh, Ramesses II decided to set up camp right outside of Kadesh in the woods next to it,Labwi. But when they were in the woods they found two Shosu Bedouin. They were later found to be Hittite people who had turned away from they army and were trying to get back to their homes. The two Shosu Bedouin told Ramesses II that the Hittites' had set up camp 200 miles away from Kadesh. When originally Ramesses II had thought that they were in Kadesh. But what Ramesses II did not know was that the two Shosu Badouin had lied to him and were really spies tricking him. So Ramesses II marched onward to win his war, but was only walking into the Hittites trap. Ramesses II lead his army across the Orontes River. But he lead his division, Amun, ahead of the other divisions. The armies then camped out just north-west of Kadesh. The four sections were all spread out from each other but mostly the Amun section. It was the farthest away out of all four divisions. Then once again in the night some of the Amun army men found two more Shosu Bedouin men walking through their camp. When captured and questioned the two men revealed to Ramesses II that the King of Hatti was already here in Kadesh waiting behind the old city's wall for Ramesses's army. This again was another trap. Ramesses II then commanded the other three army divisions to spread out on both sides of the Orontes River. Re, Ptah and Seth were all spread out and once they were, part of the Hittite army came out of hiding and attacked the Re army. Ramesses II did not want to sign a peace treaty with Muwatallis so instead he signed a truce. This was the end of the Battle of Kadesh. Ramses II king of Egypt by name Ramses the Great Sir Alan H. Gardiner, 1961. Ramesses II's Battle of Kadesh Inscriptions Megaera Lorenz, 1976. The Battle of Kadesh 2001-2008. This page was last modified on 14 February 2014, at 18:25.